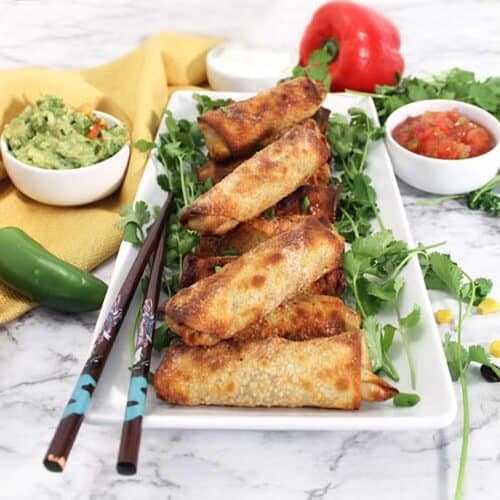 These Air Fryer Southwest Egg Rolls are the perfect game day appetizer. 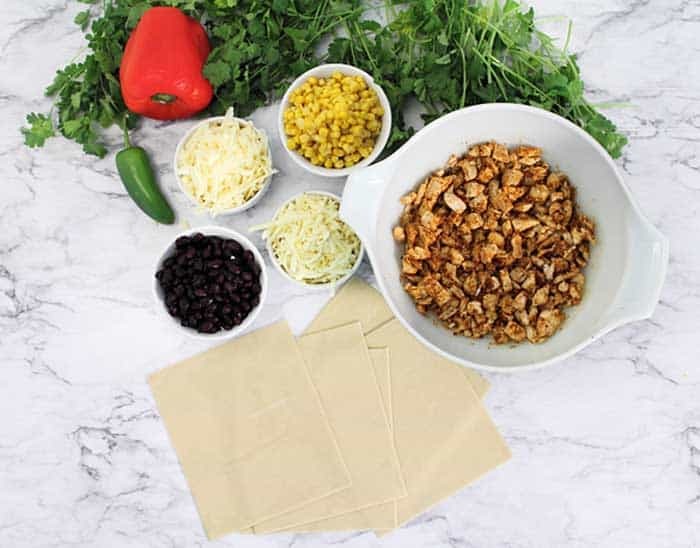 Egg roll wrappers are filled with spicy chicken, black beans, corn, minced jalapeno and plenty of cheese then cooked until hot and crispy. Less than 10 minutes in the air fryer delivers this super delicious, healthier snack for your Super Bowl party. OK folks, I thought I’d be back in the saddle again and all caught up with everything by now. Alas, being sick almost the whole month of January really knocked me for a loop. Of course, spending over 4 hours at the store changing phone carriers this week didn’t help either! Bonus though, I got a new iPhone XR out of the deal. Woohoo! Anyhoo, I’m back, a day late, bringing you these deliciously easy and super crispy Air Fryer Southwest Egg Rolls. These are the tastiest, easiest appetizers I’ve ever made too. All it takes is less than 10 minutes in the air fryer and you’re done. Now, they can be made without the air fryer but why would you want to? An Air Fryer is totally worth the counter space it takes up! Let me tell you, I was on the fence about getting an air fryer for months. I kept seeing photos of gloriously fried food without oil and the mess of hot grease in a frying pan and my husband made the decision for me and bought me one for Christmas. And am I glad he did! The Air Fryer makes just about anything quicker, healthier and with little clean-up. Believe me, this is one purchase you won’t regret and it’s totally worth the counter space it takes up. I’ve tried quite a few recipes already, appetizers like my crispy chicken wings, and dinners, with recipes coming soon, of moist pork chops, cajun shrimp and even a simple baked salmon and they all came out delicious! My husband, who usually grills a lot of our meals, is getting a rest while I air fry everything. And he’s loving it! 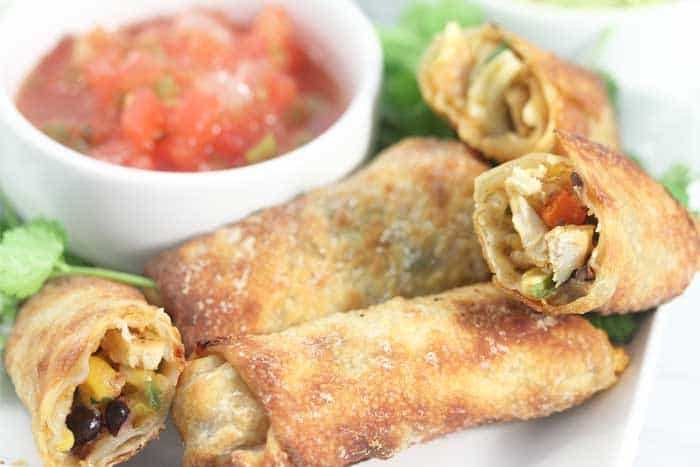 These Southwest Egg Rolls are a copycat version of my favorite appetizer from a local restaurant called Duffys. They have plenty of that southwest flavor with black beans, tomatoes, corn and jalapeno, all held together by two flavorful cheeses. And so easy to make too! 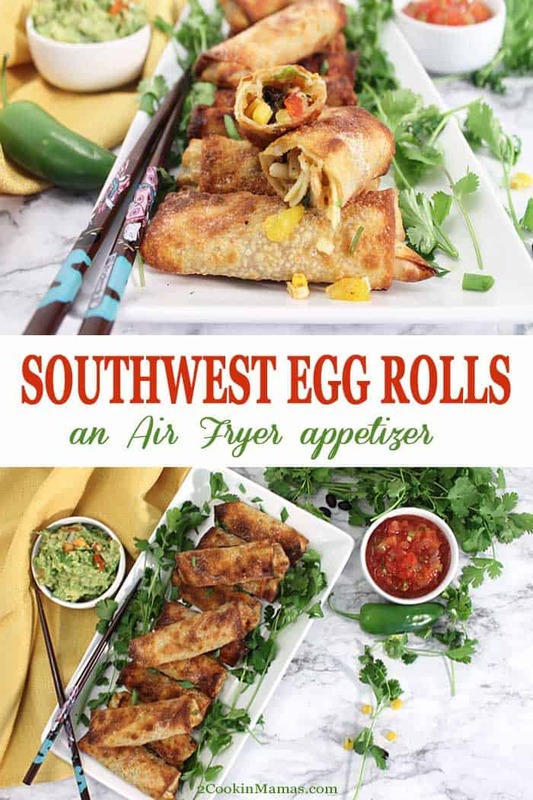 How to make Air Fryer Southwest Egg Rolls. 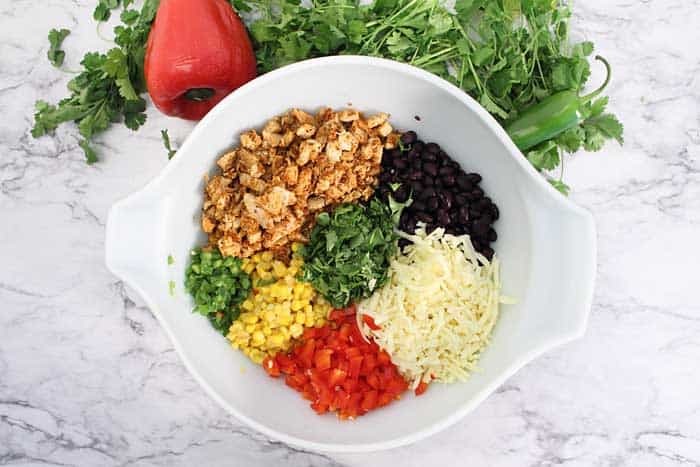 Mix up all the filling ingredients in a large bowl – diced taco seasoned chicken, black beans, corn, diced red bell pepper, minced jalapeno, chopped cilantro and shredded Monterey jack and cheddar cheeses. Lay an egg roll wrapper in front of you, on a diagonal, so it looks like a slightly misshapen diamond. Place 3 Tablespoons of filling slightly off-center on the egg roll wrapper. Bring corner nearest you up over filling and press to make it a tight roll. Slightly moisten two outer edges with a little water. Roll the rest of way, moistening top edge. Secure top edge into a little egg roll bundle. Done and ready to fry! Spray the rolls with a nonstick oil spray. Depending on the size of your air fryer, you want them to fit loosely with plenty of room for air flow, place into air fryer basket. Cook at 390 degrees for 5 minutes then open and turn and cook another 4 minutes. The cooking instructions for egg rolls that came with my fryer said 8 minutes for the initial frying time but I found they browned too quickly. In other words, check them and gauge how fast they are cooking with your particular air fryer. Just look at those crispy, toasty beauties! 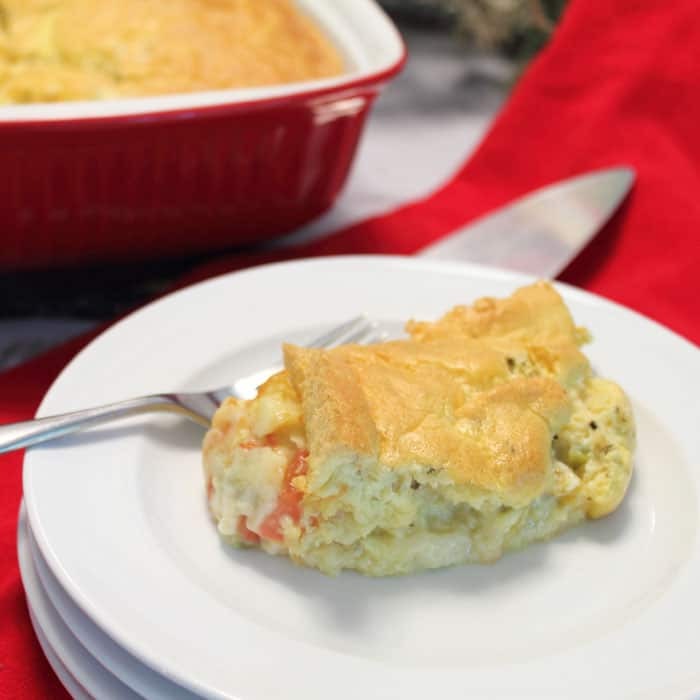 Serve with sides of homemade guacamole, salsa and sour cream. Then watch them disappear! 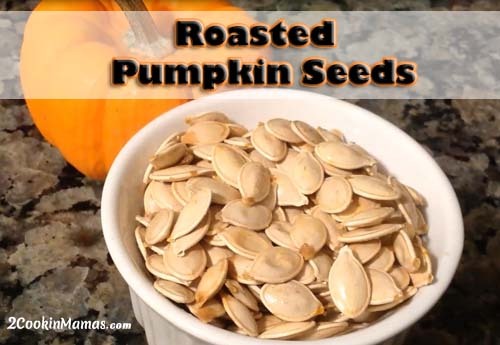 Make them in advance then fry in batches so you can keep ‘me coming, hot and crispy. Believe me, they’ll be one of the most popular Super Bowl munchies served! Quick & easy Air Fryer Southwest Egg Rolls are the perfect game day appetizer. 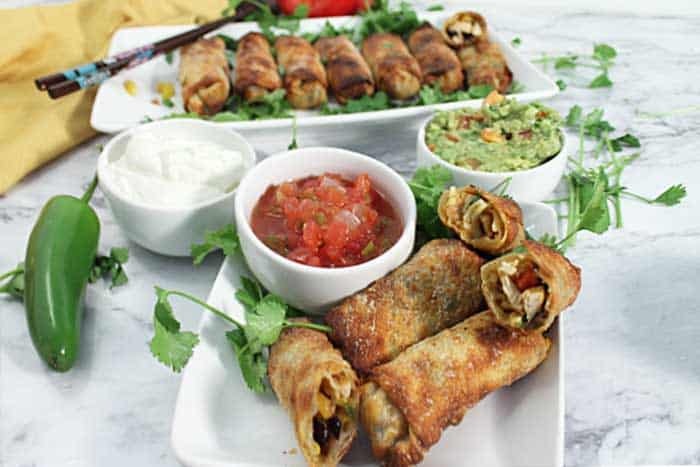 Spicy chicken, black beans & cheese, roll up into a crispy, healthier snack. In a medium bowl, toss chicken with taco seasoning that's been mixed with water. Combine chicken and next 7 ingredients. Stir well. Take an egg roll wrapper out of package and lay in front of you, with one of the corners facing you. It should look like a lopsided diamond. 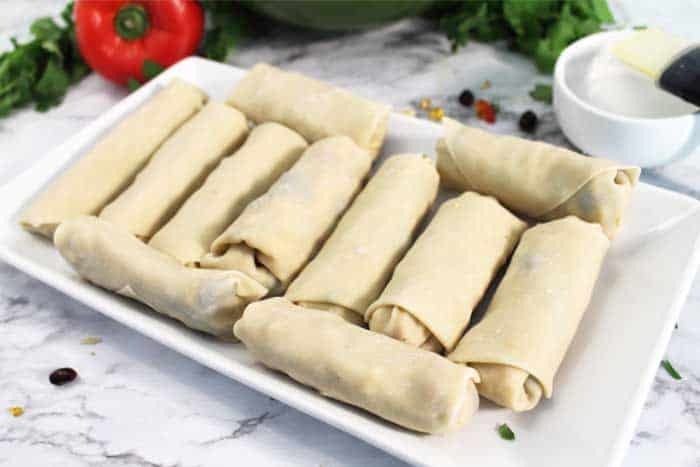 Place 3 Tablespoons of the chicken-bean mixture on the egg roll wrapper just slightly below the center. 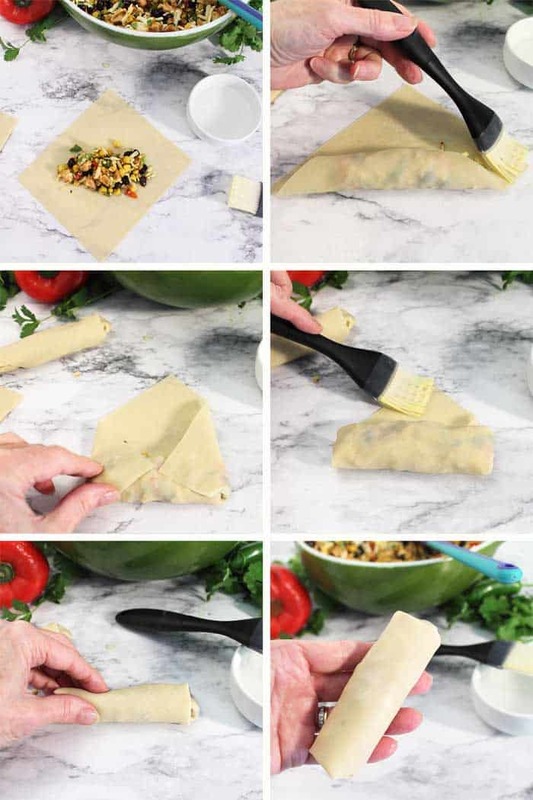 Take corner that is closest to you and roll over filling. Pull it tight against filling. Moisten the edges of the two corners to the right and left then fold over towards center and pat into place. Now continue to roll it up, moistening top corner so the roll adheres together in a little egg roll bundle. Continue with remaining egg roll wrappers. 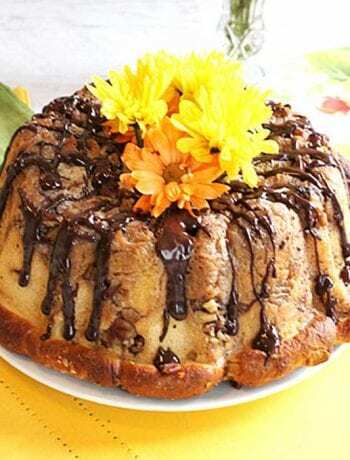 These can be made ahead and stored in refrigerator. Make sure they are covered well with plastic wrap so they stay soft and fresh. When ready to air fry, take out of refrigerator and let sit on counter for about 30 minutes to bring closer to room temperature. 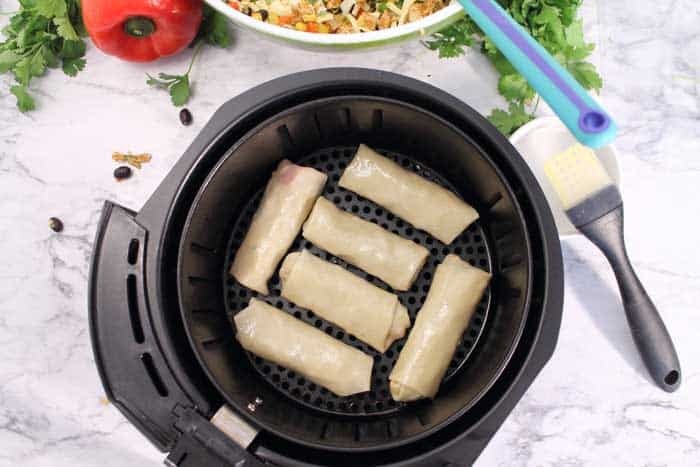 Determine how many egg rolls your air fryer will hold loosely. You want them with a little space between them so that the air can flow around them. 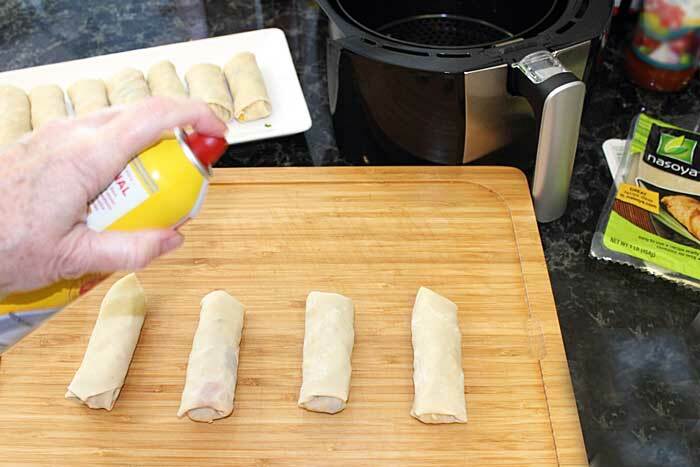 Spray the egg rolls you are about to cook on all sides with nonstick spray. I used Pam. Place in air fryer basket and cook at 390 degrees for a total of 9 minutes. At the 5 minute mark, check to see if they are nice and toasty looking. Mine were ready to turn at this stage. Turn with tongs. Place basket back into air fryer and fry another 4 minutes. Again, you can check prior to this time to make sure they are not getting overdone. Remove and serve hot with sour cream, salsa and guacamole. Don't need 42 egg rolls? Make what you want and freeze the remaining filling to use another time. Egg rolls are a favorite over here! I’m going to make them this weekend! Hope you enjoy! They’re perfect for game time or just cocooning in the house and staying warm. These eggrolls were amazing and my family LOVED them. I’m totally going to make them for the Super Bowl! Thanks! We love them here too and they’ll definitely be making an appearance at my Super Bowl party.